From the very start of the debate, many advocates for the alternative vote (AV) have insisted it eliminates the need for tactical voting. Whilst I’m sure this is a genuine mistake it does rather point to another common fallacy; that AV is simple. On the surface it is; what could be simpler than ranking your preferences in order? However, it would be foolish to judge a system solely on how it is intended to be used, whilst ignoring how it can be used. With AV, if I vote “Conservative, Labour, Liberal” am I expressing a preference for Conservative ahead of Labour, and Labour ahead of Liberal, or am I actually expressing a preference against the BNP who also stood? Perhaps the “Conservative” preference is genuine and “Labour, Liberal” is tactical? 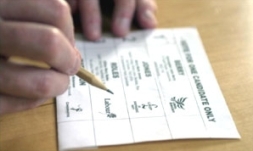 A tactical vote, to quote Wikipedia, is when a voter supports a candidate other than his or her sincere preference in order to prevent an undesirable outcome; I would re-phrase this only slightly to say it’s when a voter expresses anything other than a sincere preference in order to prevent an undesirable outcome. Tactical voting under our current first-past-the-post (FPTP) system is still a clear indication of how I intend my vote to be counted. Tactical voting under AV is nothing of the kind. It may indicate how I intend my vote to be counted, it may only in part, or it may be wholly designed to exclude an unwanted option; and there are other variations which, for the sake of brevity, I’ll omit. A mantra of “voters should rank the candidates in order of preference” doesn’t cut it when - frankly - they don’t have to, and if AV were as simple as some suggest, then its advocates would be more aware of this. That they’re not shows that it isn’t.